The newest solar farm of Florida Power & Light Company [FPL] is equipped to generate 74.5 megawatts of power, enough for approximately 15,000 Florida homes. Large numbers of Americans are not as concerned as I am about fossil fuels and how they hurt the planet and until recently have not supported sustainable energy. But as the cost of renewable power comes down, many of them are giving wind and solar a new, pragmatic look. “ ‘[In 2016], the price point was just becoming right for us to be able to have it make economic sense for our customers for us to go and begin building large solar energy centers,’ FPL spokeswoman Alys Daly says.” More here. One thought: As my friend Jean, of the environmental-education nonprofit Meadowscaping for Biodiversity, reminds me, it’s important not to cut down trees for solar arrays. Trees help the environment even more than solar energy. We need to keep the big picture in mind. Storm Huffs & Puffs. Bricks Stand. Leroy Wilson outside his home in Marianna, Florida, a day after Hurricane Michael hit the panhandle. I believe that when a hurricane is coming and you’re told to evacuate, you should evacuate. But this story about a homeowner who refused to leave is pretty great anyway. Like the wolf in the “Three Little Pigs,” Hurricane Michael huffed and puffed, but the homeowner’s brick house not only stood strong, it welcomed neighbors whose houses were not so strong. Read what Patricia Sullivan and Frances Stead Sellers wrote at the Washington Post about why the Marianna, Florida, native couldn’t bear to leave his house. It adds a whole other level to the story. “The modest one-story brick house on Old U.S. Road,” they report, “meant more to Leroy Wilson and his family than a roof over their heads. “Their ancestors lived on this land as slaves before Wilson’s grandfather acquired five acres here in 1874, right after emancipation. … So as Hurricane Michael ripped the top off a 50-year-old dwelling next door, brought a tree down on Leroy’s daughter’s home and snapped nearby pine trees like pencils, the Wilsons stayed put in their brick house on Wednesday, opening the doors to neighbors whose homes were succumbing under Michael’s powerful winds. “Sixty miles from the coast in Jackson County, this city of about 10,000 rarely suffers through hurricanes. Known as ‘The City of Southern Charm,’ Marianna has experienced storms that have taken down trees and power lines, but it has been largely spared the devastation regularly wrought in coastal towns. Hurricane Michael was different. “[Leroy’s son] Lamar, an assistant professor at the University of Alabama in Tuscaloosa, said he dismissed class around 5 p.m. Wednesday after getting a text from his sister describing the devastation in his hometown and he began making frantic telephone calls to his relatives. He knew they would not leave their land. “ ‘To be able to own several homes you built with your hands, to protect the home your mother built, that your grandfather toiled for, it’s noble,’ Lamar said. “And in this case, dangerously noble. His sister lost her home; his brother’s house is barely habitable. “But the little brick house protected the Wilsons and the people they took in. It lost its water pump and its shutters, and the wind drove water in under the window panes. But the structure stayed intact — and by the end of the evening, more than a dozen members of five families were seeking shelter there. More at the Washington Post, here. No word on a wolf coming down the chimney or the canny homeowner setting a boiling pot in the fireplace to welcome him, but I wouldn’t have been surprised. 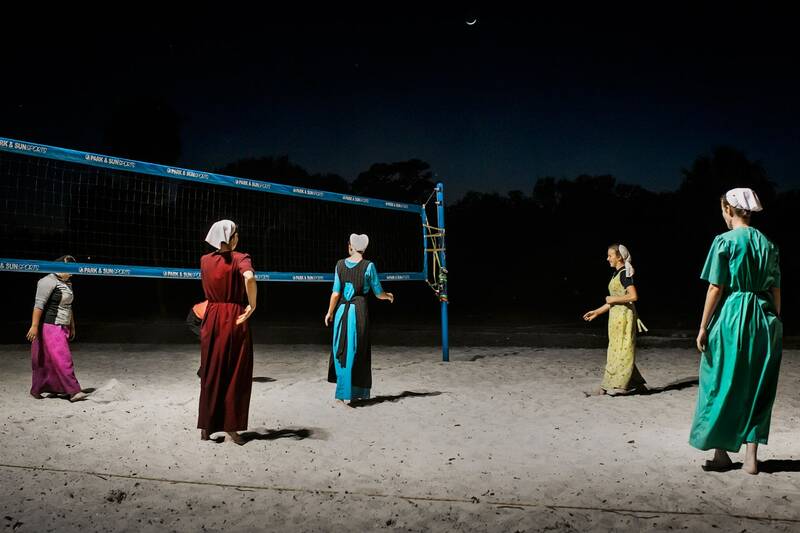 Many Amish families have been taking winter vacations for years in Florida, where the women’s volleyball game is a popular nightly event. It’s fascinating to me how the Amish culture carries on generation after generation, an apparently calm little world in the midst of the turmoil that is America. Recently the New Yorker magazine followed a group of Amish families on their winter vacation and came back with a collection of charming photos. “Earrings, usually forbidden, can be seen glittering from beneath white bonnets, and houses are outfitted with satellite dishes. … Swimming, volleyball, and shuffleboard are encouraged; ice-cream cones are a nightly ritual.” Check out some terrific photos at the New Yorker, here. Although I don’t know of any special vacation spot like that in New England, I do know that Amish people sometimes travel to Boston. I see family groups from time to time at South Station. And I always feel a kind of admiration for their lack of self-consciousness in settings where they must know they stand out. 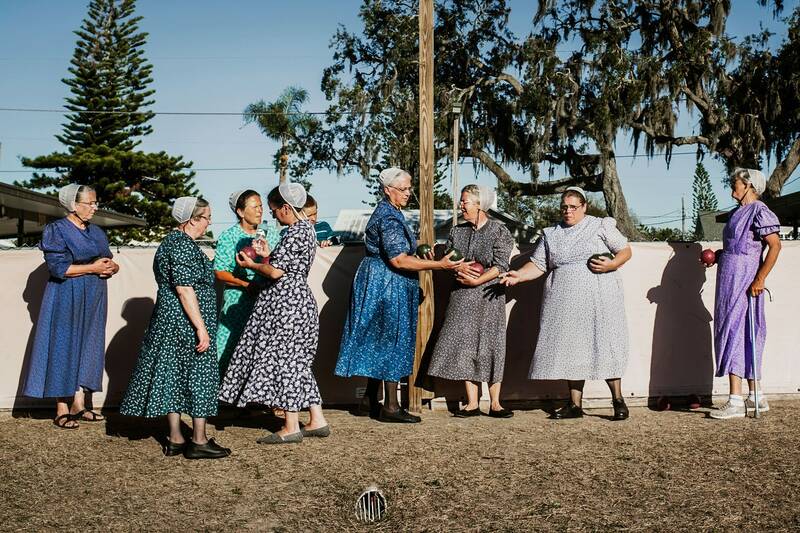 The first all-female Mennonite bocce-ball game in Sarasota, Florida. The players’ husbands stand on the side to cheer. The street art in St. Petersburg, Florida, is a selling point for tourism. It started with unwanted tagging on buildings and evolved into murals authorized by building owners and respected by taggers. Tampa Bay Times art critic Lennie Bennett has the backstory. “In recent decades, murals have become a way to spruce up bare walls of buildings and to discourage graffiti. St. Petersburg has street murals in many areas but there is a concentration of them along the downtown Central Avenue corridor. To see them at their best, you need to walk through the area. Even if you travel the route regularly by car, you’ll miss many of them because they adorn the once-drab back walls facing alleys. “Shelly commissioned Derek Donnelly to create a mural that would replace those painted-over areas and discourage future tagging. ‘A Moment to Reflect ‘was created by Donnelly and Sebastian Coolidge, another well-known street painter whose most beloved work is probably the image of a young man with elongated limbs stretching for an orange on the exterior of the clothing store Freshly Squeezed at First Avenue N and Dr. Martin Luther King Jr. Street. “Because of the murals’ growing popularity, some business owners rehire the artists to freshen up the works rather than painting over them. The Tampa Bay Times article by Lennie Bennett is here. A comprehensive tour of the murals is here. Tim is an architect and WordPress blogger who is concerned with, among other things, how real communities develop organically. He has a strong sense that creating places top-down should not be regarded as sustainable place making. Being a bit of a contrarian, I’d love to think of a contrary example, but so far I can’t. Here Tim takes off on a planned community in his neck of the Florida woods. “Wasteful land use in the form of a high percentage of non-places is the critical flaw with all drive-to places that claim to be urban or have high quality place making at their core. They simply do not, and they perpetuate the car-centric development pattern that exacerbates quality-of-life negatives in South Florida – traffic, loss of identity, and the replacement of real places with faux places. Embrace the residential patterns that are still in the area, and were once far more prominent, and include residential units of a similar urban village quality. All parking should be metered, and of the on-street variety, and the parking lot should be replaced with a public green. Retail, commercial, and office space should be geared toward neighborhood uses, with the goal of replacing vehicle trips with bicycle or pedestrian trips to a very high degree. The lighthouse promenade must actually align with the lighthouse, and, thereby, solidify a framed street scape view of this landmark in perpetuity for all to share in. The promenade is presently a few degrees off, and focuses on a point well east of the lighthouse. “Development and redevelopment projects are not inherently bad things, in fact, many developments create great pedestrian and transit oriented places that foster living, working and playing within a tight-knit community. However, developments that pretended to be great place makers, and really are not, represent a continuation of the very harmful growth patterns of the last half-century in disguise. 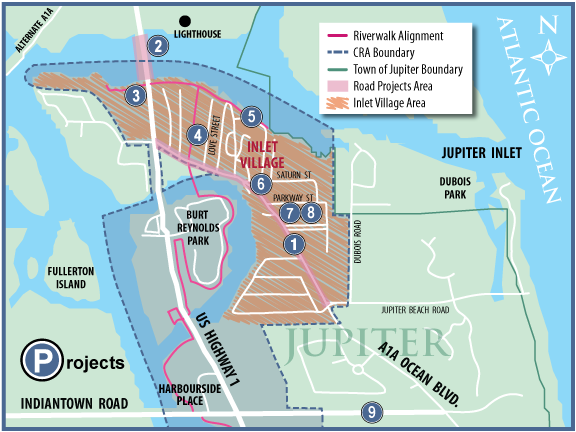 “Jupiter Inlet Village can be a great place, and an asset to the community, but it will not get there by pretending to be something that it is not.” More at Tim’s WordPress blog, here. There are people who like to cook and people who like to fish, but if they are not in the same family like John’s in-laws, the caught fish may never get eaten. Fortunately, there are now a growing number of services that will enable you to catch your fish and eat it, too. Diane Bair and Pamela Wright describe a few at the Boston Globe. “Fishing charters are wildly popular along the sunset coast of Florida. The Gulf Coast, from St. Pete Beach to Clearwater, has some of the best deep sea fishing in the country and plenty of days of sunshine and calm seas. It’s dubbed the ‘grouper fishing capital of the world,’ but mackerel, snapper, barracuda, tuna, dolphin, wahoo, hogfish, and more are also plentiful. The reporters list these spots: Friendly Fisherman (150 John’s Pass Boardwalk, Madeira Beach, 727-391-6025, www.gofriendlyfisherman.com); Sea Critters Café in St. Pete Beach (2007 Pass-a-Grille Way, 727-360-3706, www.seacritterscafe.com); Conch Republic Grille (16699 Gulf Blvd., N. Redington, 727-320-0536, www.conchrepublicgrill.com); and Maritana Grille (3400 Gulf Blvd., 727-360-1882, www.loewshotels.com/don-cesar/dining). Descriptions of the delicious preparations here. My husband and John have often brought back bluefish after going out on G Willie Make-It’s charter. G Willie (Bill) cleans the fish you want and sells the fish you don’t want to local restaurants. Not everyone loves bluefish, but the first one of the year says summer has arrived. 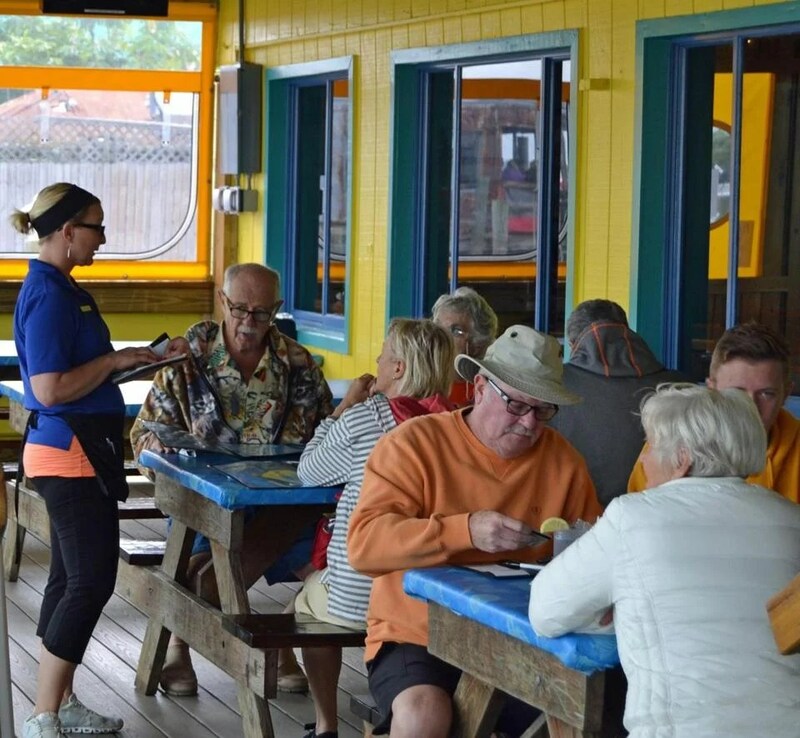 Eating on the outside deck at Sea Critters Café, where you can get the fish you caught turned into a meal. Candice Frederick, of the New York Public Library’s Schomburg Center for Research in Black Culture, recently posted research by Katherine Ellington on an African American artist who was new to me. From Ellington notes: “Augusta Savage was among [a] group of artists who came to Harlem from the Jim Crown South in search of opportunity and where her creative expression could thrive. “My quest for Augusta Savage (1892 –1962) sculpture led me to a first-time visit to the Art and Artifacts Division of the Schomburg Center for Research in Black Culture. … As a young girl in the early twentieth century, Savage began shaping ducks out of red clay found in the backyard of her home in Green Cove Springs, Florida. Savage’s work gained local attention when she entered and won a prize at a local county fair, which led to community support for further study.